Back in the early 90s, Capcom was the king of the arcade. The most obvious example was Street Fighter 2, and all its myriad special editions. But vs. fighters weren't the only games munching quarters back then. 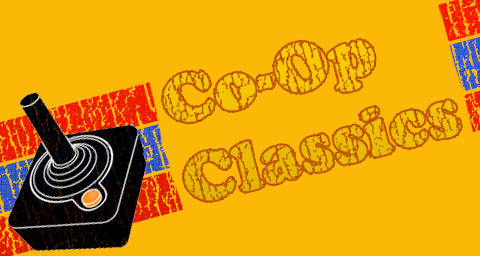 The co-op brawler genre was extremely popular, and many of the best brawlers were from Capcom. The Punisher, Captain Commando, Alien Vs. Predator, and the Dungeons & Dragons series were just a few of the amazing offerings from Capcom. Another Capcom gem is the topic for discussion today: Knights of the Round. Though the title is inexplicably shortened, Knights of the Round is loosely based on the Arthurian legends about the Knights of the Round Table. Three characters are available for your bashing pleasure, nicely color coded for ease of use. Dozens of enemies impede you on your quest to recover the Holy Grail. 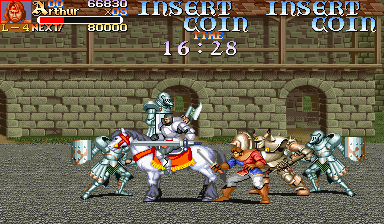 In many ways, Knights of the Round is a fairly standard beat em up: attack everything, score points, move right, repeat, etc. But there were several interesting features that really make the game stand out amongst its peers. I suppose the most compelling thing about Knights of the Round is the legendary nature of the characters. 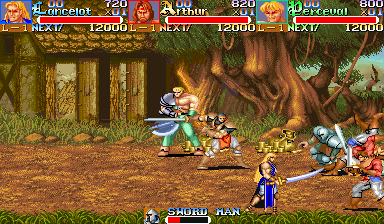 In a time where characters in co-op games had names like Ryan and Jimmy Lee, and were almost exactly alike, save for color coded T-Shirts, being able to play as mythical figures like Arthur, Percival, and Lancelot was different. Adding to the appeal was the difference in play style of the trio. Lancelot was swift but the strikes of his slim saberlike sword were fairly weak, the complete opposite of slow, powerful axe-wielding Perceval. Arthur was the balanced character, coupling moderate speed with good melee capability. Before each level begins, a map of the area is revealed, so you can see what's coming your way. That's fairly unusual for a brawler, but even more unique is the in-game timer. From the beginning of each level, the clock counts down, urging you on as quickly as possible. In my experience, the timers were quite generous, and the clock was never too much of a problem. I suppose it was implemented to keep the stream of quarters going. The enemies in Knights of the Round are quite varied. Several different types of soldiers, from footmen all the way to giant knights clad in full plate are joined by teleporting, flame tossing magicians and even tigers and birds. Each enemy had its own health bar, which was quite helpful in all the chaos. They even had on-screen names, from the mundane (Soldier, Tall Man) to the exotic (Sorcerer, Mad Tiger, Buster S). Page created in 1.6081 seconds.